THE HAGUE – Former Chairman of the Consultative Body for Dutch Caribbean persons in the Netherlands Ocan psychiatrist Glenn Helberg is running for Parliament. He is a candidate on the slate of new Article 1 party of Sylvana Simons for the March 15, 2017 Second Chamber elections. ent who descents from one of the islands. The last two Members of the Second Chamber of Dutch Caribbean descent, John Leerdam and Cynthia Ortega-Martijn, left Parliament a few years ago. Helberg (62) is number 18 on the slate of the Article 1 party headed by Simons who is of Surinamese descent. The Curaçao-born Helberg hopes to secure a seat in the Second Chamber to better serve the interests of the Dutch Caribbean community and the Dutch Kingdom in general. “Being in the political arena enables you to be directly involved,” he told The Daily Herald on Tuesday. Equality within the Kingdom is one of Helberg’s main objectives. “I want to aim for a situation where the Kingdom provides opportunities for everyone, to create a win-win situation that is beneficial to every citizen of the Kingdom,” he said. 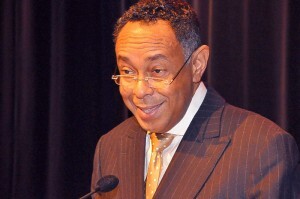 “We have to move away from the ever association of the Dutch Caribbean and corruption. Naturally corruption, wherever present, should be tackled. But not with the accusing finger in the direction of the islands and the people should certainly not have to pay for this. Also, persons from the islands coming to the Netherlands should be fully respected,” said Helberg. Within the Article 1 party, Helberg will work on themes such as the relations within the Kingdom, poverty alleviation, gender equality and the acceptance and emancipation of homosexuals, lesbians, bi-sexuals and trans-gender persons. As former Ocan Chairman, Helberg brings a wealth of expertise on the issue of integration. The party programme will be announced soon, after which the candidates will start their campaign. The list of candidates includes one other Dutch Caribbean person: Marianella Leito, an accountant hailing from Curaçao. “Article 1 is a party of diversity,” said Helberg. “There is a large gender diversity within the group of candidates. We are leaving the traditional concept behind of men and women, black and white, mother and father, heterosexual and homosexual. We don’t think in terms of contradictions, but equality. We are a party of inclusion, not exclusion,” he said. The newly elected Ocan Chairman Leerdam will run on the slate of the Dutch Labour Party PvdA for the voting district Caribbean Netherlands.